As another summer comes to an end and the winter chills are showing up, i’d like to appreciate the rest of the sunshine we have left by flirting my way out of summer in colours and settling down in winter. If there’s one thing i’ve learned this summer, is that everything will be ok, take life one day at a time and believe that God has great things in store for me. I’ve laughed, cried, ate my heart out, shopped until i couldn’t feel my feet and connected with lots of bloggers. What a perfect way it is to slowly say Au revoir to summer by wearing this miss Selfridges short and pink shirt and pairing it with my recent purchase “my bad boy boots”. I feel like I can’t wish farewell to this summer just yet. It feels like it had just arrived yesterday and now it’s gone again! On the other hand, I can’t wait to start wearing my knits again! I think yellow suits you extremely well! You put your outfits together really nicely! Love your colorful outfit. especially top. I can’t believe singer is almost over! Sad times but it was good whilst it lasted. I love the outfit hun. Such an effortless outfit that looks so classy, you look great hun! And the pictures are fab! I cannot tell you how much Im looking forward to wearing normal clothes as opposed to maternity wear!! Waahhh!! lol. Love the colour blocking and styling but this post has made me realise that The Big British Winter is gracing us shortly. Beautiful! The colours really compliment each other, and look gorgeous against your skin tone! PS Total leg envy going on right now! Gorgeous outfit, you look lovely 🙂 I love your blog and I have followed you with Bloglovin, if you ever get a chance to check out my blog I would be delighted, thanks! Best wishes. I really love your shoes! Even though I’m sad to see summer go , I’m so excited for autumn! AW fashion is my fave, and all the new lines look amazing! Such a stunning look the colours are so vibrant and suit you perfectly! Buma – you look incredible! 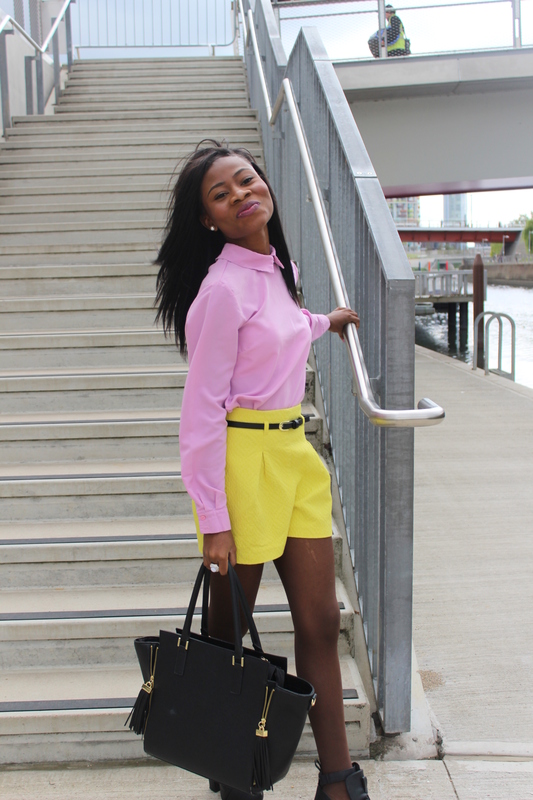 I love the shoes but the colour combination in this outfit is just bang on – love it.